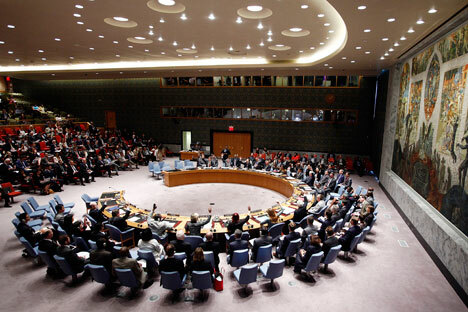 Six members of the Security Council, including the UK, the United States and France, rejected the Russian draft resolution. The Kremlin regrets the UN Security Council's refusal to support the Russian resolution on Syria, Kremlin press secretary Dmitry Peskov has said. "All we can do is to express our regret that this draft resolution has not been supported," he told reporters. Russia will carry on the consistent, transparent and clear course towards stability, the fight against terrorism and preservation of Syria's territorial integrity, Peskov said. The day before, Russia submitted to UN Security Council members a draft resolution on support for Syria's sovereignty and territorial integrity in connection with Turkish actions as regards Syria. Peskov was asked whether Russia would respond to the appeal of U.S. President Barack Obama and Turkish President Recep Tayyip Erdogan to stop "strikes on moderate opposition in Syria." "Russia is carrying out its consistent course to support and assist the Syrian Armed Forces in their offensive against terrorists and terrorist organizations," Peskov said.